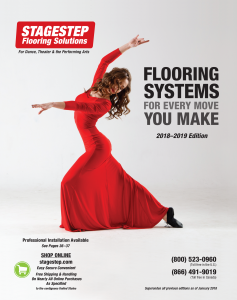 The ultimate multi-purpose floor ideally suited for all movement activity including tap, clogging, ballet, modern, character, ballroom, jazz and flamenco. Heavy duty portable and permanent flooring for stage, touring and studio. Can handle heavy scenery and props. Surface can be treated for differing degrees of non-slip. *Special order colors available in full rolls only. Allow for 8-10 week shipping time. The professional standard for floating wood resilient permanent and semi-permanent subfloors over concrete slabs and other hard surfaces. Resilient and energy absorbent. Safety and performance at a great price. 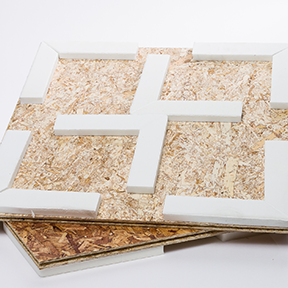 The nominal 2′ x 2′ pre-fabricated Random Wafer Board panels, with patented tongue and groove connection system, rest on “L” shaped high density foam suspension forms. 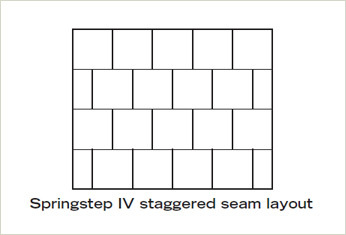 Springstep IV offers excellent energy absorption and resilience. Panels are sealed for water resistance. Its tongue and groove system allows for easy assembly. Easy to disassemble, move to a new location, and re-install. * Circular saw may be needed for custom fit. Aluminum compound taps can disintegrate on flooring, leaving a black/grey residue. Click here for maintenance instructions. To avoid this residue, use aluminum or steel taps. Use TapShield or FloorShield Maintenance System to reduce problem. 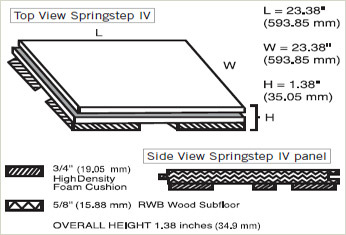 Springstep IV 23.38" x 23.38" x 5/8"
Springstep IV-A 23.38" x 23.38" x 5/8" 1/2"
Springstep IV-B 23.38" x 23.38" x 5/8"
Springstep IV-C 23.38" x 23.38" x 5/8"
Springstep IV-D 23.38" x 23.38" x 5/8"